Dug out the cars, took each for a drive to test…definitely am more comfortable with how mine drives in the snow compared to the minivan. 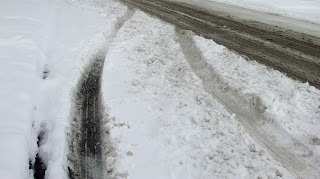 We had a bit more to contend with because we are on a major street that gets plowed….so we get a bit extra snow. The fun part: parking mine. These are my ruts, but the picture doesn’t quite do it justice. Hmmm…can we go back 5 years and consider the All Wheel Drive version of the Vue?